Well, it's official. Ebony has been dubbed Sir Galahad! He started crowing the other day and there is no doubt he is a rooster. Oh boy. Don't need/want any more roosters. Hoping that he will remain docile enough with the other rooster(s) so he can stay. He certainly is a handsome one. He seems really laid back but he is still pretty young. I think around 6 months or so now. Time will tell. I'll keep y'all updated :). 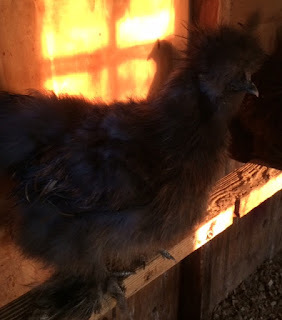 I am back to a rooster dilemma again. We are currently building a retirement home for Cedric, my top rooster who is quite disabled. He still think he rules the roost but he has such a hard time getting up and down out of the coop and getting around due to a serious unknown leg injury about a year ago. He is now just 3 1/2 years old but has been through so much. He will have his own coop and run area along with about 4-5 hens I choose to stay with him. It may well be that Sir Galahad becomes a roomie too. We shall see. How do you handle rooster overpopulation?